In Part 1, we discussed the challenge of collecting student work online in an effective and efficient manner. And it turned out that a tool called Doctopus was the answer to workflow needs! Here, in Part 2, we will look at the next tool needed to make online grading spectacular! And if Doctopus wasn’t a crazy enough name, how does Goobric sound? Doctopus and Goobric are a packaged deal. You can’t get to Goobric without Doctopus, and whether or not you are using Google Classroom for online submissions of work, trust me, you’re going to want to get your hands on Goobric. Before I jump in, I would like to give the same preface that I did in part 1: Google. You and your students all need Google accounts. They are free and easy to set up. If you are fortunate enough to teach at a school site like me where you work within a Google domain, everyone is ready to go! And if you’re doing this from scratch (signing yourself and your students up for Google accounts), it will only be a few extra steps. Once you’re set, you it will be a snap to get going. There are two elements to grading student work here. First is the pesky part of attaching the Goobric. The first time through will be clunky, but it gets smoother with each use. Let’s get through the first element to get to the treasure of the second. After you have sent out the assignment through either Google Classroom or Doctopus, and the students have completed the assignment, your next step is to set up the tool for grading it! This is where you need to install a Chrome Extension called Goobric. Here is a video I found that shows a quick set up: Goobric Installation with Doctopus. Open the assignment you made on a Google Sheet. Find the Google Sheet Rubric you made. 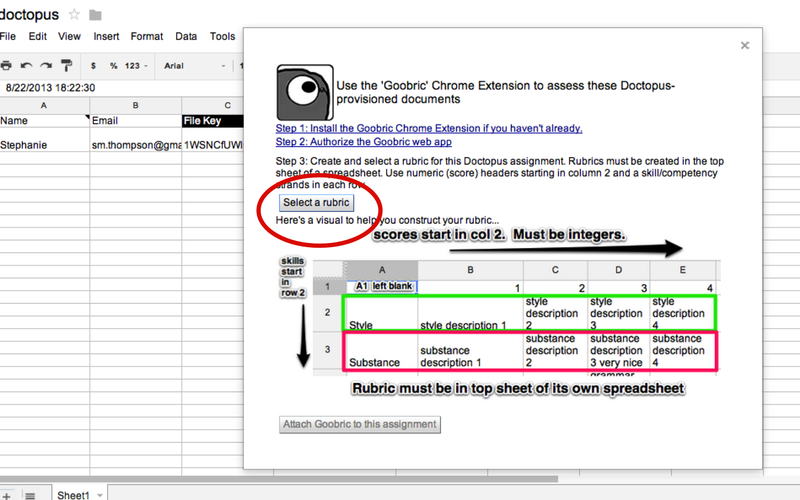 Now you’re ready to start grading with the Goobric extension. This is the part that we’ve all been waiting for: grading online. At this point, I only use Goobric for grading student essays, and so my use of of the tool is limited to assessing student writing, but there are many more applications for other subject areas as well. Goobric functions on top of Google Docs and is perfect for grading essays in addition to the features that are already great for that particular app. Here is a list of all the benefits I have found through grading a class set of essays with Goobric + Google Docs. Overlays rubric on the top of the browser = stay on one tab, don’t go back and forth. This beats flipping back and forth on paper, especially if you had students staple their rubric to their final draft. This also beats clicking from one tab to another. Hide the rubric, if you want. The overlaid rubric at the top of the browser can take up a lot of screen real estate. Hide it for when you don’t need it, then bring it back when you do. Comment on specific parts of the essay, using Google Docs comment feature. Go beyond the rubric and give targeted feedback on phrases, sentences, and paragraphs. If you have some pre-slugged comments, you can save time by copying and pasting those in (more on that in the next post). Write a terminal comment to be stamped at the bottom of the essay. Better yet, leave a voice recording of your terminal comment! Instead of taking the time to write, you can leave a verbal terminal comment. You can comment at the speed of thought. It frees you up to make a well-rounded comment. Email the assessment to the student immediately after you’re done grading it. This removes one more possibility of losing a paper in transit. It also applies a subtle pressure to you as the teacher, because students will start talking to one another about their scores. There are even more advantages to using Goobric with Doctopus, but some of those features come after all the assignments have been assessed. Features like sorting data by criteria and getting a clear picture of where students are struggling by virtually restacking the students by their rubric scores. This has implications for PLCs and tiered learning groups. But those are subjects for other posts. What do you think? Is Goobric for you? How can using this tool enhance your grading practice? What keeps you from grading student work online? Let us know in the comment section below. If you know others that are interested in these ideas please share on social media. I love the idea. 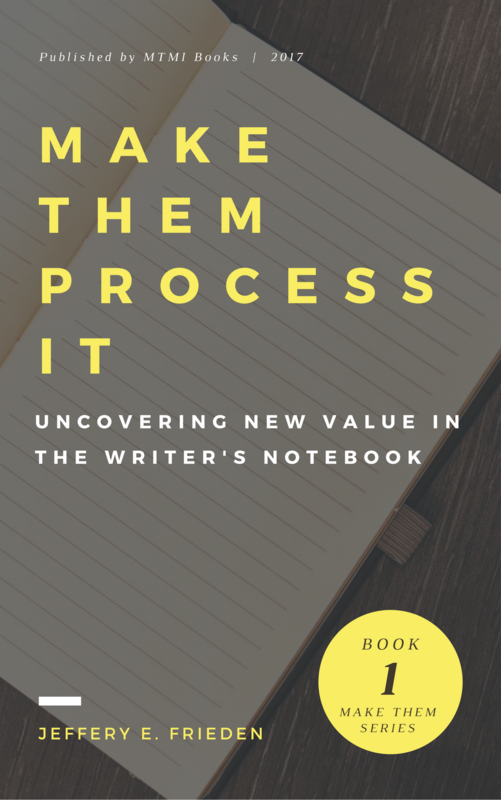 Sounds like it would provide more insight for the students and will further their writing.